Quick and Easy. With the heat of summer fully upon us, no one wants to spend time in a hot kitchen over a hot stove. This is the perfect meal solution to keep you cool all summer long! Join chef Alan in creating an amazing crostini made with Leaning Ladder toasted baguette rounds topped with ricotta cheese then topped with roasted black or red grape and balsamic vinegar compote and garnished with toasted pine nuts, fresh lemon zest and chopped fresh rosemary. Next enjoy grilled romaine heart salad topped with an heirloom tomato, avocado and red onion mixture drizzled with vinaigrette using Leaning Ladder’s oils and vinegars. 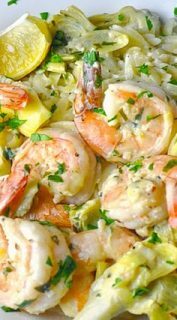 Your Shrimp & Artichoke entree will demonstrate a technique using sealed foil packets to create simple yet delicious meals to keep you out of the kitchen and in the cool all season long!